It’s time to get your Muskoka Home ready for the cold weather! It’s finally here the first nip in the air that signals a change of season. From the first days of September, which probably still feel like summer, to the last, when you will be able to notice a chill in the air and even a frost or two. September is a time of transition. Get your home ready for the season ahead by choosing some of the tips from my “to do” list, from adding cozy layers to scheduling necessary maintenance. Make things cozy. With the first few chilly nights under our belts think about swapping out lighter-weight bedding for flannel sheets and fluffy duvets. This will allow you to keep the furnace turned off for a week or two more! Bring added warmth to your living room with throws and pillows in rich fabrics and deep colours. Remember that area rugs and curtains not only make a room feel cozier, but they also can help your home feel warmer and can help reduce your energy bills. Order in your winter fuel. Get a jump start on the local demand by calling the fuel oil or propane supplier your use and getting your tanks topped up. If you use a wood stove for actual warmth or just for coziness, now is a good time to order a delivery of firewood. Remember, don’t store large quantities of wood directly against your home or cottage as it can encourage pests, but do keep it protected from rain and snow. Vacuum radiators, baseboard heaters and heating grates. Prepare for the heating season by vacuuming up dust from radiators, baseboard heaters and heating grates. If you have radiators with covers, remove the covers and vacuum beneath them before replacing. Check safety devices. Take a few minutes to do one of the most important tasks you can for your family…test the smoke detectors and carbon monoxide detectors and replace batteries as needed. Don’t forget to check the expiration date on your fire extinguisher and replace if needed. Clean and store your AC units. If you use window air-conditioning units, now is the time to either remove them or cover them outside with protective insulation. Removing the units is better as it allows, you to close the windows and this will minimize winter heat loss. Use a shop vac to clean the dust and debris out of the vents before covering them for storage. Cover or store outdoor furniture and BBQ. If you plan to leave your patio furniture or BBQ outside through the fall and winter, cover them well and stow them beneath an overhang that will protect them from rain and snow. Add weather-stripping. Newer windows may not need weather-stripping, but it will help most older windows retain heat and stop drafts. Doors, including the patio doors you will not use too often during winter, also need to be sealed if they are older. Check areas with previously applied weather-stripping and remove or replace as needed. Inspect the roof and gutters. This one may need to be done at the end of the month or even next month if the leaves are late changing this year! Clean out the gutters and downspouts, pull out any sticks or other debris blocking the gutters, and make note of any worn-out seals around vent pipes and chimneys. If you do not feel comfortable on a ladder, or have a home of two or more stories, hire someone to do a quick inspection for you. Schedule any needed repairs now so that your home will be ready for winter. Schedule chimney and furnace maintenance. Make sure your fireplace and heating system are clean, safe and ready to go by having a professional look at them now. Having your chimney cleaned will also ensure that you don’t try to start a fire when an animal nest or creosote build up is inside. If you don’t have a chimney cap yet, speak with your chimney sweep about adding a one. The metal cap with screened sides can prevent critters from getting in and helps protect your roof from burning embers. Maintain the washer and dryer. Cleaning out the dryer vents can be a DIY job, but if you don’t feel comfortable doing so (or if you’ve been putting it off), you may want to hire a pro to do washer and dryer maintenance for you. Washing-machine hoses need to be replaced from time to time, and a cracked hose can cause a leak — which can mean costly damage to your home. Clean dryer vents and hoses will help your machine work more efficiently and reduce the risk of fire. With these important things looked after, you can look forward to the change of seasons knowing that you’ll be safe and warm in your Muskoka home. OK, so the snow fell, the thermostat dropped, and you still have not done any winter prep around your Muskoka home or cottage. All is not lost; the weather man says that it will be gone in a day or two, so you still have time to get things done. Let this little dive into winter be a great reminder that you still have a few unfinished home maintenance tasks left to check off the list. Here are some helpful lists I have put together for you from the many great resources on-line. Hope you find them helpful. Check the weather stripping around windows and doorframes for leaks to prevent heat loss. Replace weather stripping, if necessary. Replace all screen doors with storm doors if you have them. Replace all window screenswith storm windows if you have this type of window system. Examine wooden window frames for signs of rot or decay and repair if required. Ensure rain or snow drains away from the house to avoid foundation problems. Make sure the ground slopes away from the house. Add extra soil to low areas, as necessary. Clean soil from planters. Bring pots made of clay or other fragile materials indoors. Remove any attached hoses and store them away for the winter to prevent cracks, preserve their shapes, and prolong their life. Inspect decks for splintering, decay, or insect damageand treat, if needed, to prevent further deterioration over the winter. Clean leaves, dirt, and pine needles between the boards of wooden decks to thwart mold and mildew growth. Move your snow blower and shovels to the front of the garageor shed for easy access. Flush hot water heater tank to remove sediment, and check the pressure relief valve to make sure it’s in proper working order. Check for deteriorated flashing at the chimney, walls, and skylights and around vent pipes. Seal joints where water could penetrate using roofing cement and a caulking gun. Check the gutters and downspouts for proper fastening, and re-secure if loose or sagging. The weight of snow and icecan pull gutters off the house. It is always a challenge to get started with a long list of chores but by taking care of your property you prolong the life of it and you will enjoy a safe and warm winter in this beautiful winter wonderland we call home. Fall in Muskoka is world famous and for good reason, our colours are magnificent! We are blessed with the prefect climate and mixture of tree verities to cause a raucous explosion of reds, yellows, and browns contrasted against the lush evergreens. Add to this the stunning natural landscapes and waterscapes and it is a win-win for Muskoka. Of course when you live in this beautiful environment making the most of it is vital! Who doesn’t want to spent every minute they can enjoying what has been provided for us? Here are some great ideas for some events to make your Muskoka Fall a great one. Find a pumpkin patch. Pick up some pumpkins, gourds and fall flowers to decorate with. The more, the merrier. An abundance of pumpkins and gourds in different shapes, sizes and colors makes for a cheerful display that will last through the autumn months. If you have little ones, make it a tradition to take their picture sitting among the pumpkins. Many of our Muskoka garden centres put together a great display so find one and have fun. Don’t forget that picture! Celebrate the harvest. Invite friends and family over for a potluck or visit one of the many fall fairs and festivals happening at this time of year. From biggest pumpkin contests to live music, there’s something for everyone and it is a great way to be able to reflect on the richness of the land we live in and be thankful. Cook up a storm. With things being a little cooler in the fall, it’s a great time to send the day making batches of your favorite things. It’s also a perfect time to make good use of the harvest. Making a pie from scratch, or batches of spaghetti sauce or loaves of pumpkin bread – I can smell it just writing about it! Football anyone? For football fans, fall means only one thing: game time. Set up comfy seating around the TV, make some tasty snacks and invite friends over to watch the game. Even if you are not a fan you can make it an excuse for snuggling up with your loved ones and spending time together ….Dad will probably love this one. An apple a day. Find an orchard that offers pick-your-own apples and head out for a fun day of picking fruit right from the trees. Picking at an orchard is not only fun, it gives you the opportunity to taste varieties of apples you have never tried. Don’t forget the cider and if the orchard is too far away you can find great apples at the farmers markets all over Muskoka. Get your “Martha Stewart” on. Change up your home décor by layering beds with thicker quilts, drape a cozy throw over your favorite armchair and set out bowls of apples and nuts. It doesn’t take much effort, and your home will instantly feel more fall-like. Jump in a big pile of leaves. The inevitable consequence of Fall is that the leaves will fall! 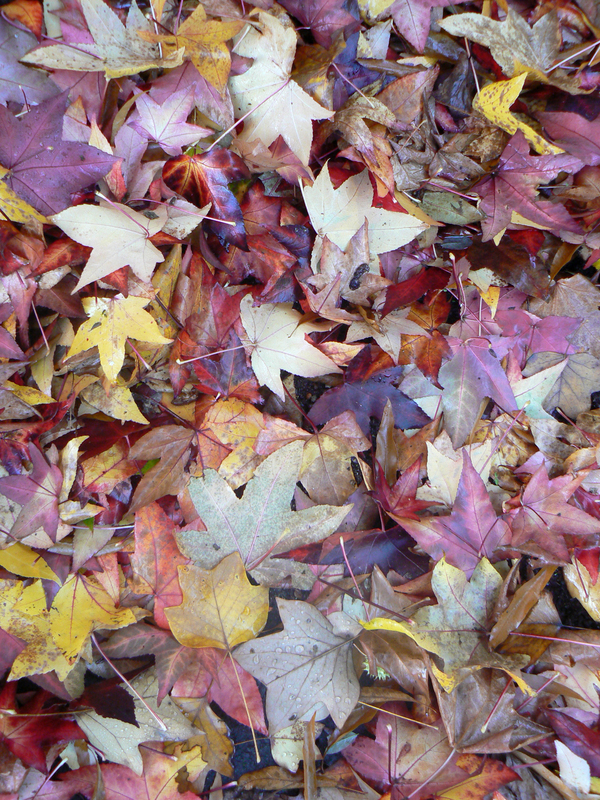 We all have to face the leaf raking or blowing day sooner or later so make the most of it. You don’t have to be a kid to enjoy the sound of leaves crunching underfoot or the joy of leaping into a giant leaf pile. If you want to, just go for it! It’s S’more season! Toast marshmallows for s’mores outside or just pull up a chair and get warmed up around the fire. There is something so comforting about watching a fire, and fall, with its crisp weather, is the perfect time to enjoy it. A drive and a picnic. If you live in Muskoka you may not think about taking a drive to simply look at the colourful fall foliage but sometimes we need to take time out to really “see” the beauty. Plan a day trip to scope out the colours on a scenic drive. For added fun, pack a few edibles, a blanket and most importantly the camera, and make a memory. Make a “thankful tree.” In preparation for Thanksgiving cut a branch and stand it in a bucket of sand. Gather some of the magnificent leaves and rub them with hand lotion to keep them from drying out and clip them on your “tree” with a small hair clip or paper clip. Then cut some leaf shapes from paper and invite your friends and family to record something they are thankful for on the paper leaf. Clip the paper leaves to real branches in amongst the real leaves and place it where everyone can appreciate it. There are almost as many idea’s for fall as there are leaves falling but hopefully one or two of these will inspire you and help you find just one more reason to love being in Muskoka this fall.